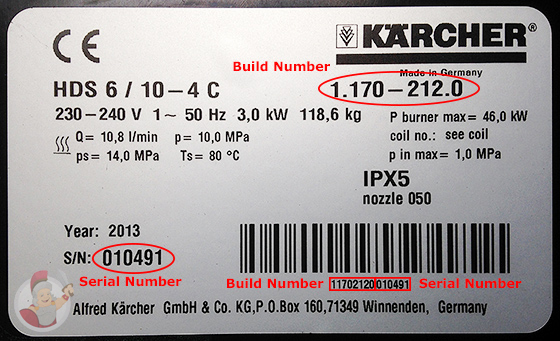 To help find the correct part for your Kärcher pressure washer, we first must identify which variation of the model you have. All commercial and domestic pressure washers from Kärcher should have a white sticker very similar to the one shown below. On HDS models this could be on the main chassis near the wheel or on the side of the canopy. For the Home and Garden models you should be able to find this on the base, or where the mains cord flows into the unit. As shown in the image below, there should be a number starting with a 1, in this example: 1.170-212.0. If you’re having trouble locating the number, then the digits under the barcode will be equally as helpful. © 2019 Septimus Spares | Authorised and regulated by the Financial Conduct Authority for credit-related regulated activities.